One of the designated campgrounds on Antelope Island is located at White Rock Bay. 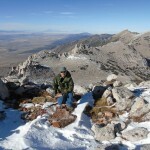 Besides camping, Antelope Island offers several other activities. From most areas in Tooele Valley, you can look across the Great Salt Lake and see mysterious islands rise up from the water. The most famous and accessible is Antelope Island. As I zoom on Interstate 80 toward Salt Lake City, I often look across the lake at the island, its terraced benches and pointed barren peaks, and wonder what it would be like to explore there. The entire island is part of Antelope Island State Park and is administered by the Utah Department of Natural Resources. To get to Antelope Island, follow Interstate 15 north from Salt Lake City to exit 332 Antelope Drive. Turn left and follow the road west through Syracuse and you will arrive at the Antelope Island main gate. The fee to pass through the gate and cross the causeway to the island is $10 per vehicle. Camping is possible in designated campgrounds only, starting at $15 for the first night and $12 each additional night. At first I thought the fees were high, but after seeing the improvements that have been made at the island, it appears the money is being re-invested for the benefit of visitors and wildlife. The gate attendant should provide you with a trail map of the island, but if they don’t, ask for one. The map is useful and will help you determine what area you want to see. Some things you need to keep in mind when visiting Antelope Island are bugs, sun and buffaloes. First, the bugs. If you haven’t been to the Great Salt Lake before and you hate bugs, depending on the time of year, the island may be swarming with them. Don’t take this information lightly or you will be sorry. Gnats, brine flies, midges and mosquitoes can be bothersome, so make sure you don’t forget mosquito repellent. The park will not refund your entrance fee if you get out there and decide you can’t handle the bugs. Inquire with the island staff about the bug situation before your visit. It can be hot out there and the sun will beat you down, so take sunscreen and drink lots of water. Lastly, you will see buffaloes if you visit Antelope Island. These shaggy beasts may seem docile, but if you approach them, which you should never do, they could become agitated and charge. They can run as fast as 30 mph, so if you think you’re going to outrun them, you’re wrong. Follow park policy and never approach buffaloes. I had the opportunity to spend a few days at the island while I attended an endurance horseback ride with my daughter. We camped in a designated area on the southeast end of the island near the Garr Fielding Ranch and the views in the morning, afternoon and at dusk were incredible. Imagine looking across the water toward Salt Lake City and seeing skyscrapers seemingly rise out of the lake with the snow-capped Wasatch Mountains behind them. I didn’t ride in the competition and was free to explore. I reconnoitered the island, and while driving, stopped at every turnout, interpretive sign and trailhead I could find. I also stopped by the visitor’s center and learned a lot about the island that I didn’t know before. The visitors center has a small auditorium where interpretive meetings are held and short informational movies are shown. This clean, modern facility is situated on top of a low ridge on the north end of the island. According to information there, the building’s beams were made from reclaimed pilings from the Lucin Cutoff, which is an old railroad trestle that once spanned the lake. There are restrooms and a gift shop there, too. If you walk out the back door of the visitors center, you will have a great view of the causeway. The causeway itself is remarkable. You can walk or bike across it, and there is ample room to pull your vehicle off to the side, get out, and observe the scenery. At the west end of the causeway is a memorial to U.S. Special Operations Forces that perished in the lake during a training exercise. While admiring the landscape and rocks, I saw a peculiar, large bird standing on a rock. I snapped a few photos of it and later learned it was a chuckar. Chuckars, pelicans, California gulls and other birds are seen all over the island because it’s situated on migratory routes for millions of birds. After the visitors center, I drove around to the Lady Finger Trailhead, which has good parking. The Lady Finger trail is only .25 miles long, but it provides access to the northernmost tip of the island. While walking along this rocky trail, you can hear the chatter of tens of thousands of California gulls nesting on tiny Egg Island located off shore. The views of Buffalo Point, the Promontory Mountains and Fremont Island from this rocky little peninsula are a treat. Continuing west from Lady Finger, you will come to Bridger Bay, named after Mountain Man Jim Bridger. It is said he was the first white man to see the Great Salt Lake. This is the best place on the island to swim in the lake. There is a nice beach with restrooms and showers. If you decide to swim, be sure to rinse the salt brine off afterward. The Island Buffalo Grill, the only restaurant on the island, is located at Bridger Bay. There is also a large campground in the shadow of Buffalo Point. 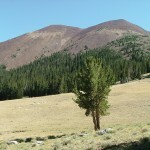 Just west of Bridger Bay, a large hill rises above the surrounding terrain 600 feet higher than the lake’s level. This is Buffalo Point. At the base of the point is a parking area and trailhead. A short but steep trail leads to the rocky top of Buffalo Point, where exceptional Great Salt Lake vistas await. To the west are Stansbury and Carrington Islands. 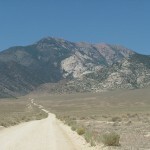 To the south are the snow-capped Stansbury Mountains, and straight down the island’s spine, you can see the highpoint of 6,586-foot-high Frary Peak. White Rock Bay, with its mile-wide beach and tiny white rock island, is directly below to the south. 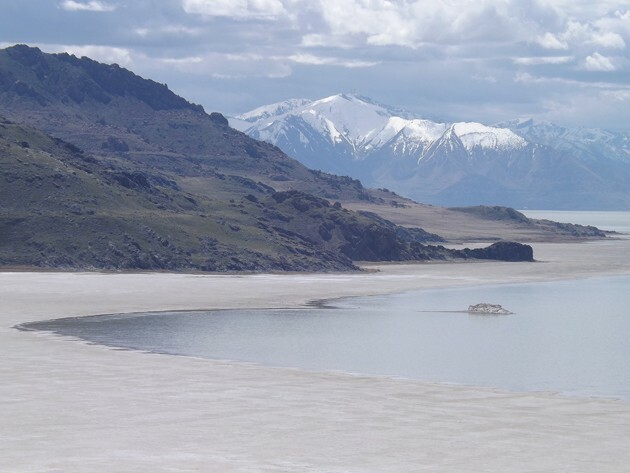 The remote, western shore of the island forms a grand scene with the snow-covered Oquirrh Mountains in the background. 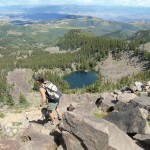 The Lady Finger and Buffalo Point trails could easily be hiked in one visit and you could even throw in a swim at Bridger Bay and try your luck at “floating” in the Great Salt Lake. In next week’s article, I will cover the trails in the middle and south end of the island and take a closer look at the Garr Fielding Ranch homestead. For more information about Antelope Island, see stateparks.utah.gov/parks/antelope-island or call 801-725-9263 or 801-773-2941.